Bruce Banner, separated from the Hulk (from a "nutrient bath" invention of Doc Samson's), marries Betty Ross, despite the Hulk and Thunderbolt Ross’ interference. The Hulk is forced to remerge with Bruce Banner, but regains his original, (verbalizing) brutish personality - and grey. At the same time, Rick Jones falls into Doc Samson's nutrient bath and becomes a long-haired Hulk himself. Bernie Rosenthal breaks up with Captain America. After the (first) Scourge of the Underworld massacres 18 super-villains at the Bar With No Name, he is defeated by Captain America, and killed by the 2nd Scourge. John Walker, the Super-Patriot (later US Agent), campaigns against Captain America. The Defenders break up after the now-possessed Moondragon, the Gargoyle, the Valkyrie and Andromeda seemingly perish fighting the Dragon of the Moon. Doctor Strange helps Topaz escape from Hades. Doctor Strange meets Rintrah, a minotaur-like mystical being. Heather Hudson becomes the new Guardian/ Vindicator. The demon inside Puck (Black Raazor) is revealed, but contained. Lady Deathstrike (Yuriko Oyama) appears and attacks Wolverine for his adamantium. Marrina and the Sub-Mariner wed (Namor effectively leaves the Avengers). Alpha Flight enlists the Purple Girl (daughter of the Purple Man, later Persuasion). Since Xavier has left Earth, the New Mutants get a new head teacher - Magneto. The psychic twin sister of Captain Britain, Psylocke, meets the New Mutants, and begins an association with the X-Men. Scott Summers and Madelyne Pryor have a son, Nathan (later, Cable). Wolverine encounters the newly-weaponized Lady Deathstrike. Jean Grey is rediscovered. 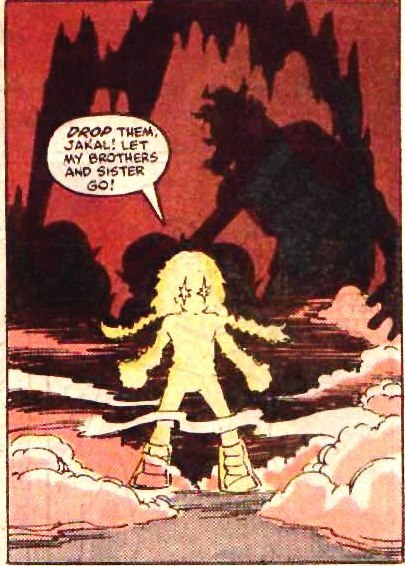 She is apparently Jean before the Phoenix Force created Phoenix. The original 5 X-Men (Cyclops, Marvel Girl, Beast, Iceman, Angel) reunite as X-Factor. Scott Summers leaves Madelyne Pryor. In their first mission they meet Rusty Collins, a fire mutant. X-Factor recruit Arthur "Artie" Maddicks. They then encounter Apocalypse and his Alliance of Evil (including Frenzy), as they attempt to kidnap Michael Nowlan, a mutant with power-increasing abilities. The reporter Trish Tilby and the Morlock mutant Skids appear for the first time. Mutant Massacre: Mutant Marauders (Arclight, Harpoon, Malice, Scalphunter, Vertigo, Sabretooth, etc...) kill many underground Morlocks and seriously injure many mutant heroes from the X-Men, X-Factor and the New Mutants. Wolverine fights Sabre-tooth. Apocalypse recruits War for his 4 Horsemen. Spider-Man encounters the Sinister Syndicate (the Beetle, the Rhino, Hydro-Man, Boomerang and Speed Demon). Silver Sable meets the Sandman. The assassin Foreignor (Silver Sable's ex-husband) begins to take an interest in the Black Cat. Spider-man encounters the odd Humbug. Thor and Beta Ray Bill encounter Kurse, who is empowered by the Beyonder. Due to Loki's machinations, Thor briefly becomes a frog. The WCA encounter the demonic Master Pandemonium. The Hellcat and Damon Hellstrom changes his codename to Hellstorm, and aids the WC Avengers. Tigra briefly reverts to human form and borrows her old Cat suit from Hellcat. The Wasp encounters a new female Yellowjacket (2), using her ex-husband's technology. Kang travels through the multiverse killing off the divergent, failed versions of himself. A new version of the Masters of Evil (Moonstone, Blackout, the Wrecking Crew, Goliath, Tiger Shark, the Absorbing Man, Titania, Mr. Hyde, the Fixer, Baron Zemo and Yellowjacket II) essentially defeats the Avengers, but the Wasp rallies with the additional help of Ant-Man, Dr. Druid, and Thor. The Scarlet Witch & the synthezoid Vision have “twins” (which later are revealed to be something other than they appear). At the same time, the mutant Quicksilver and the Inhuman Crystal begin having serious marital problems. On an alternate Earth, the Squadron Supreme takes control of the global government and creates a utopia by modifying criminals' minds. Nighthawk, morally outraged, leads a rebellion and is killed. Iron Fist is seemingly beaten to death. Luke Cage is blamed, making him a fugitive again (later it is revealed that this Iron Fist was actually an imposter). Cloak and Dagger's friend Brigid O'Reilly is transformed into the poisonous Mayhem. Karen Page, now a drug addict, reveals Daredevil’s secret identity to the Kingpin. The Kingpin almost destroys him, but Daredevil is "born again" with the help of his long lost mother, Maggie. 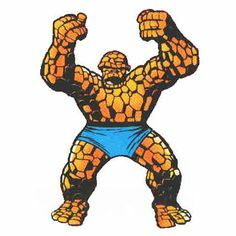 The Thing rejoins the Fantastic Four, but begins wearing a full body costume, and becomes more misanthropic and resentful than ever before. Been a bit busy this Autumn and missed 1986, Uatu! Just getting caught up with the blogs now! At this point in time, I was still buying every Marvel title I saw.